The Still Traveler | books, adventures, etc. : Crown of Midnight. BEST. BOOK. IN. THE. SERIES. SO. FAR. I don't know what it is with these young adult series that I read that the second book is sooooo much better than the first book. Yet again, for S.J. Maas's Crown of Midnight, the second book to her Throne of Glass Series, I find myself getting more lost and invested in Celaena's world. Crown of Midnight follows the happenings after Celaena Sardothien takes over her new job as the King of Adarlan's champion after her triumph in the series of challenges in the first book, Throne of Glass. In this book, we get to learn more about the magic in Adarlan. There's so much to talk about this book I don't even know where I should start. Eitherway, this book is definitely the "turning point" of this series. And it was well-written and constructed to really feel that way. A lot of things happened that started the change in the lives for many of the characters, especially the three main people: Dorian, Chaol, and Celaena. Dorian has powers you guys!! He! Has! Magic! I am excited for him because of this. The possibilities for his arc just got endless. Especially with the whole "the king of adarlan is his father and that guy hates magic" thing. I may have not liked him in the first book because he seemed "too perfect" for me there. Two things made me love him in this book. First, he has magic to suppress so it makes his every move and his capabilities just as exciting. Two, the bits where he's just trying to get it together everytime he realizes/sees/feels that his best friend and the girl who just friendzoned him love each other are so heartbreaking I found him more of a relatable and lovable. I found myself getting more attached to his character. I just couldn't help but get my heart crushed everytime I read about him sadly looking at Laena and Chaol from a far distance. Meanwhile, my ship sailed in this book!! Chaol and Celaena (warning: spoilers) were the cheesiest thing in the first part of this book. That was only in the first part of the book, though. Before Nehemia's death. Which was caused by Chaol. BUT ACCIDENTALLY. In this part of the book, I didn't see the need for Celaena to lash out at Chaol so much-- they only needed proper communication and it would've been better. Since I already mentioned this, Nehemia's death is one of the "best" fictional deaths I have ever read because of how it broke the ice for the characters and of course, for Adarlan. It didn't only set Celaena's motivation to fight back at the King of Adarlan. It made Dorian resist his father even more and of course, Chaol started questioning his loyalties. That's a great turning point for the characters that I looked forward to from the other books. The last fight scene in this book. I was surprised with how little action Dorian got in this part of the story considering how the "love triangle" is still a thing between these three people. This was also the part where it is revealed that Celaena is Fae-- she has powers. And while the fire power was amazing enough already, the way she looked like as a Fae is something that I loved too. I love how it's not calming beautiful. To Chaol, in the way he described Celaena's change, she was more terrifyingly beautiful. The pointed ears, the better senses, the more polished fighting skills, and of course the fangs--good lord that took it away for me. I'm just happy about how this story closed. It showed a fragile side of Chaol who we now saw was actually fragile when it comes to the people he loved. He gave up his duty as Captain of the Guard just to make sure that Celaena will be in Wendlyn, safe from the hands of the King of Adarlan. The part where they were bidding their goodbyes and how Celaena told him the r-e-v-e-l-a-t-i-o-n that will certainly change a lot of things for the next book. No doubt. And I'm excited for it. 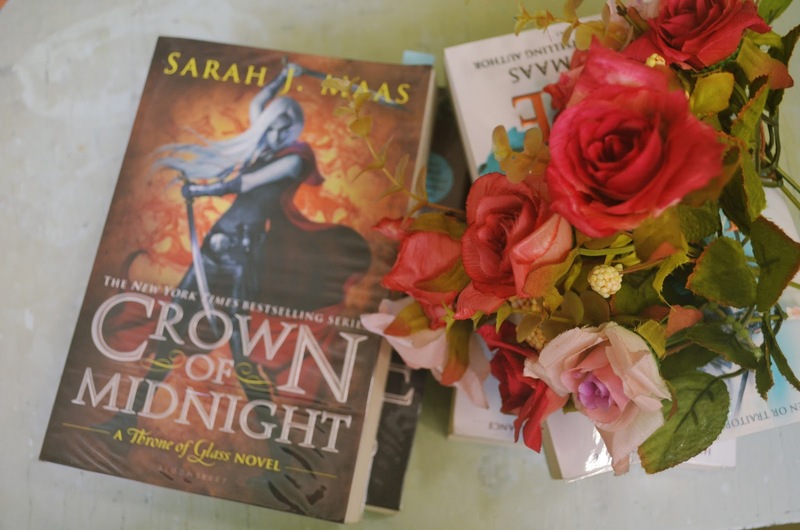 Read on my Throne of Glass review here.